I wanted to send paper invitations for our Joyeux Noel celebration, but the limited number of guests meant that it didn't make sense to order custom. So instead I decided on these vintage-inspired postcards by Cavallini. 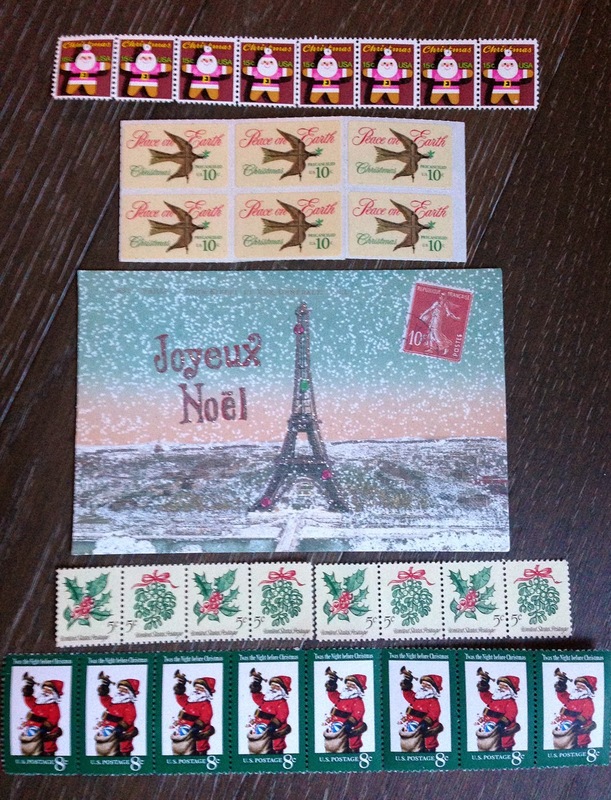 I also found vintage holiday postage on Etsy. Each stamp was between 5 to 15 cents, so I had to include several to add up to enough postage. 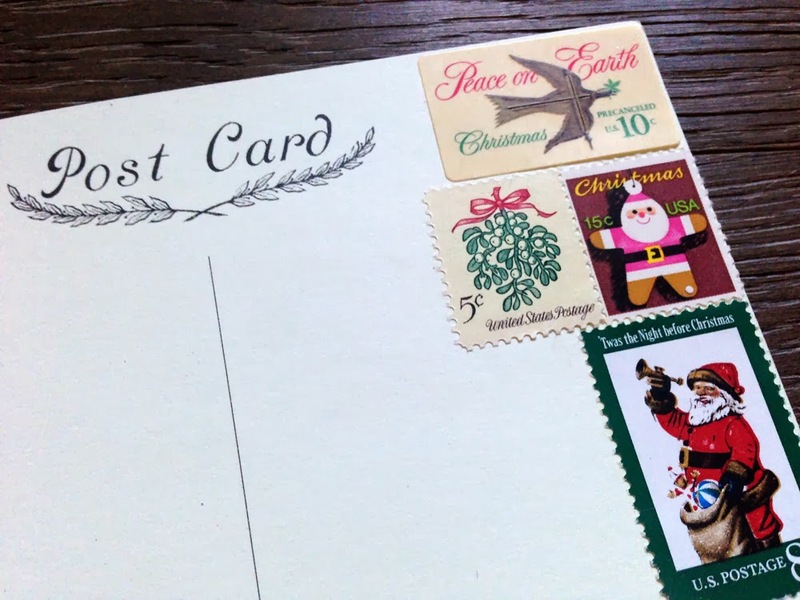 A tip for doing this - arrange the stamps prior to writing the address, so you don't have to place the stamps around your text. I matted and framed one of the extra postcards and placed it on my bar cart to continue the theme. For the sparkling cocktail I used Belvoir Fruit Farms' latest cordial, made of apple, plum and cinnamon - the flavors seemed very wintry and festive. I simply poured 1/3 of the bottle into a pitcher and topped it off with champagne. 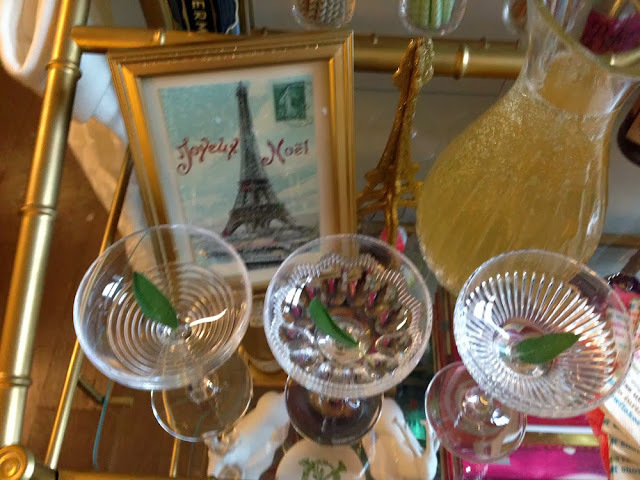 I placed a sage leaf in each coupe glass while waiting for the guests to arrive. I apologize for the blurry photo - trying to photograph everything while entertaining gets a little hectic! 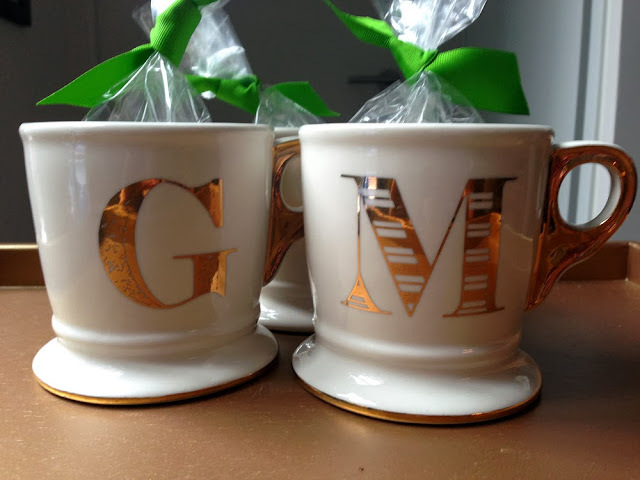 For the favors, I bought these golden monogram mugs from Anthropologie (now available in black) in each guest's initial and placed a clear treat bag inside. I bought extra of the desserts, which I placed inside along with any leftovers at the end of the party. Topped off with a green ribbon to match the tablescape. Et voila!